Part II of our Travelog continues here, with more general pointers, and a list of restaurants and art spaces that we visited. (Part I is here). A general word of caution if you’re travelling during Ramadan, not everything is open all the time, or at the hours publicised online – this includes both art galleries and restaurants. So try and check ahead where possible. With the galleries, we would highly recommend e-mailing in advance to introduce yourself. People are generally friendly, and will let you know about special events that might be taking place at their premises, and which haven’t been hugely publicised. (As an aside, we’ve also written up a number of these places separately on the blog, so feel free to have a nose around if you’d like more detailed information). Krack – A too-cool-for-school collective of printmakers whose tongue in cheek works and merchandise entertained us to no end. It’s small space so can be covered in a very short time. That said, you’ll want to linger a bit to have a chat with the good folks in the gallery if they’re around. 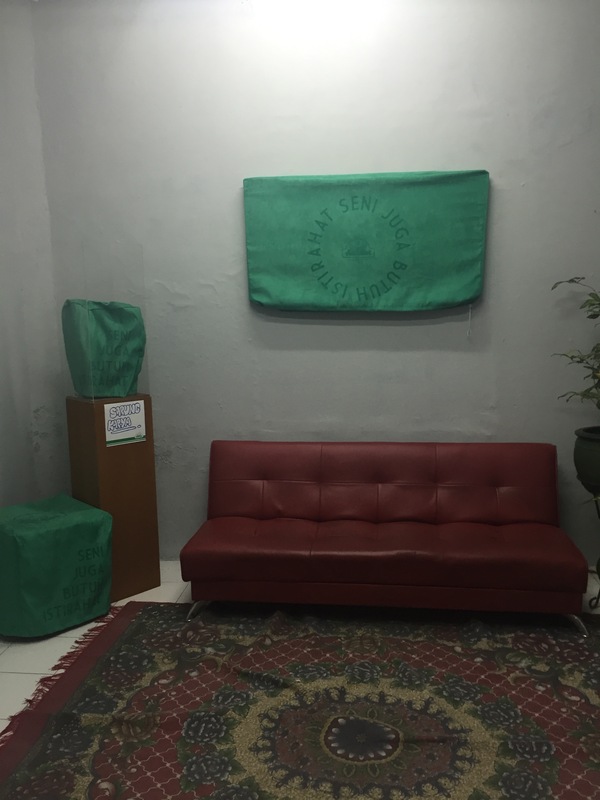 Address: Jalan D.I Panjaitan RT: 42 RW: 12, Suryodiningratan, Kota Yogyakarta. A cheeky bit of contemporary art in Ace – the art work is covered up and the signs say “even artwork needs to take a break”. 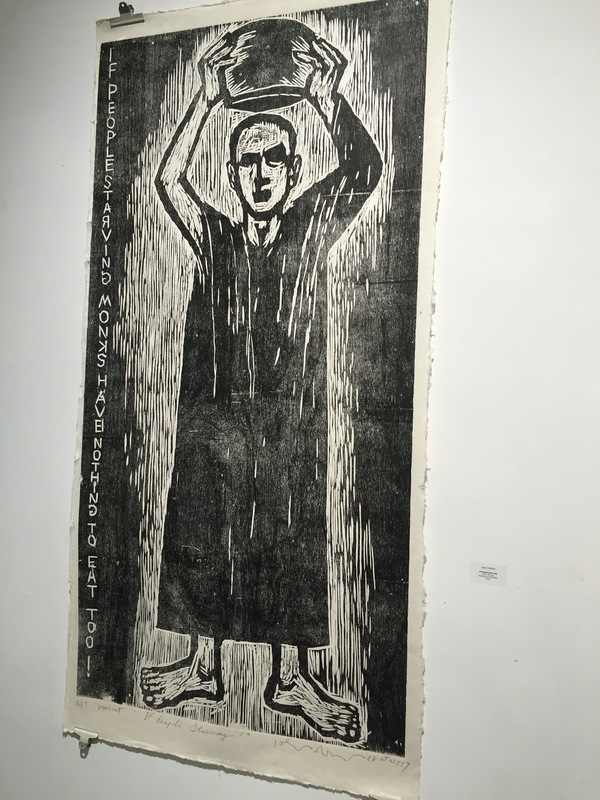 Langgeng Art Foundation – A smallish gallery, with an interesting selection of works, including the terrifying piece below. Address: Jalan. Suryodiningratan 37, Daerah Istimewa Yogyakarta. 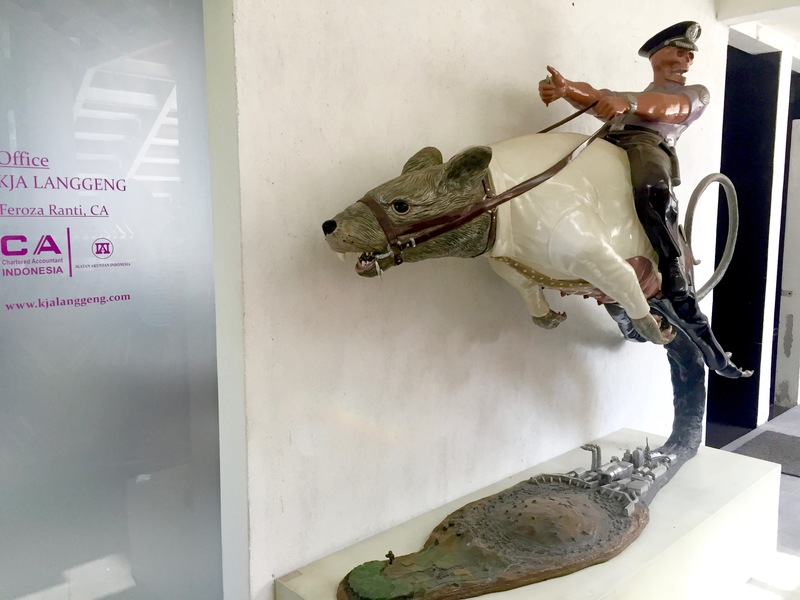 Scary stuff at the Langgeng Art Foundation (and by that we mean the sculpture, not the Chartered Accountant’s office). Note: Langgeng is also pretty close to Ark Galerie (a few steps down the road at Jalan Suryodiningratan 36 A), which came highly recommended to us, but was unfortunately closed when we visited. In terms of publicly available information though, both Langgeng and Ark should be open on Sundays, which isn’t typically the case for the other galleries, so it’s worth bearing that in mind when planning your itinerary. The Phoenix Hotel – The hotel itself has great food and drink at not-crazy prices. It also has very good ginger sweets at reception which I shamelessly plundered at every available opportunity. It’s definitely worth booking breakfast with the room, as the spread is breathtaking and well worth the extra cash. We had dinner there too one night, and it was a great experience. Address: Jalan Jendral Sudirman No. 9, Cokrodiningratan, Jetis, Yogyakarta, Daerah Istimewa Yogyakarta. 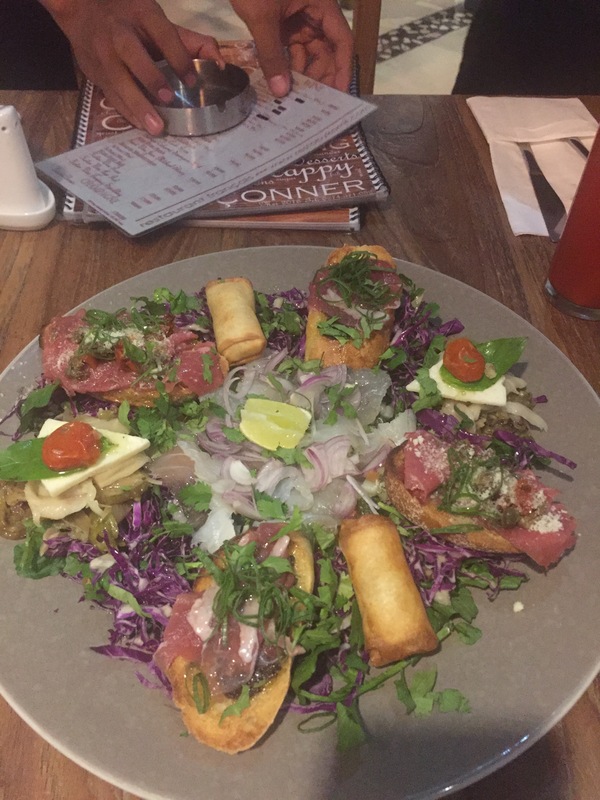 Mediterranea – This works when you have had enough of local cuisine (we didn’t really understand this logic, but just thought we’d put it out there for you Western food lovers). Address: Jalan Tirtodipuran no 24A. Mantrijeron Yogyakarta 55143. The appetiser platter at Mediterranea – looks like multi-coloured slime, but was surprisingly satisfying. We’d also recommend the duck confit and prawn risotto. 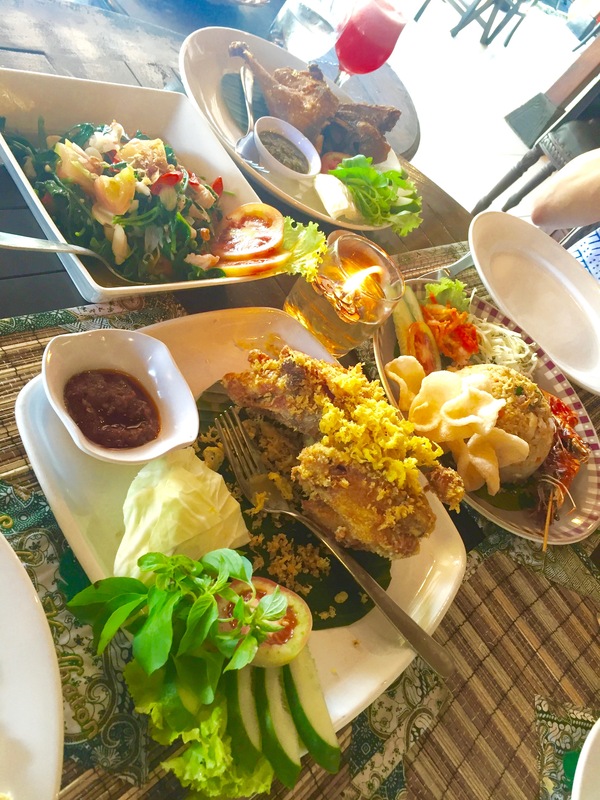 Bu Ageng – Everyone seems to know this one, and it truly lived up to our expectations. It’s just down the road from Mediterranea and Via Via. 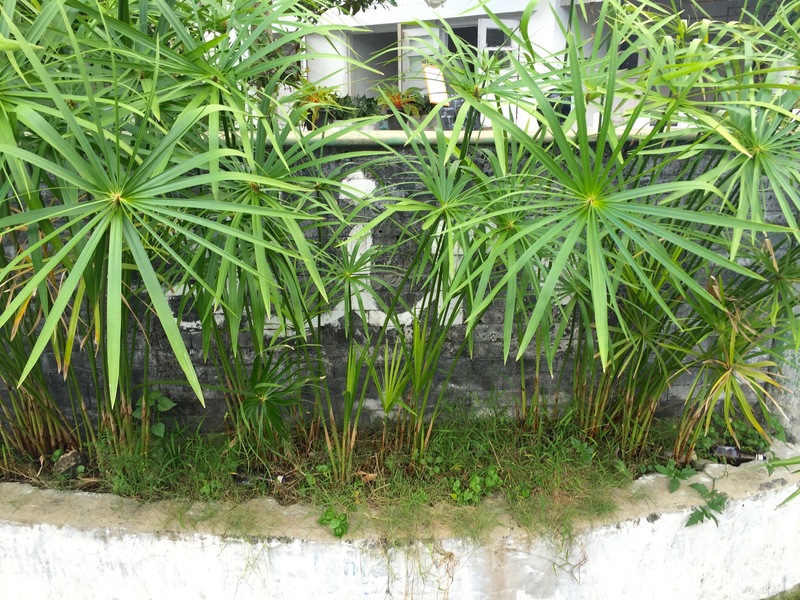 Address: Jalan Tirtodipuran 13, Mantrijeron, Daerah Istimewa Yogyakarta. 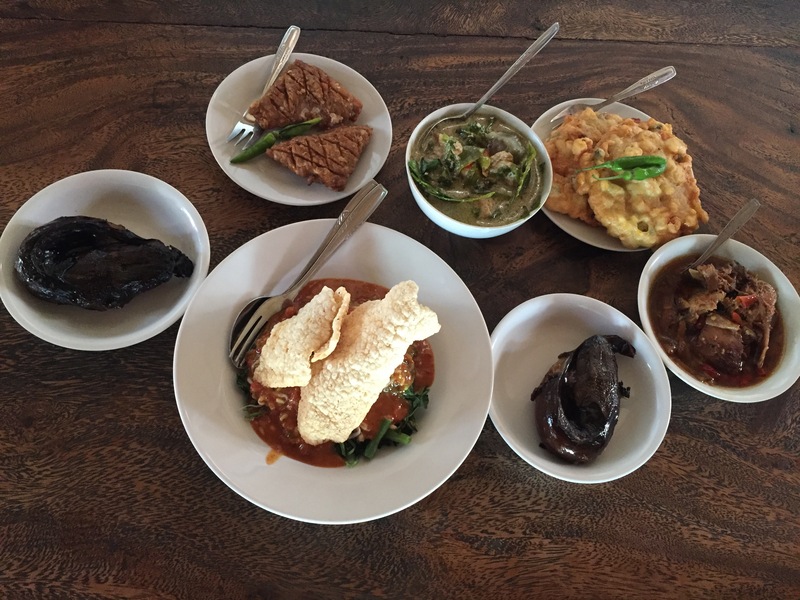 Smoked catfish, corn and crab fritters, chicken curry, sayer lodeh and tempeh at Bu Ageng. 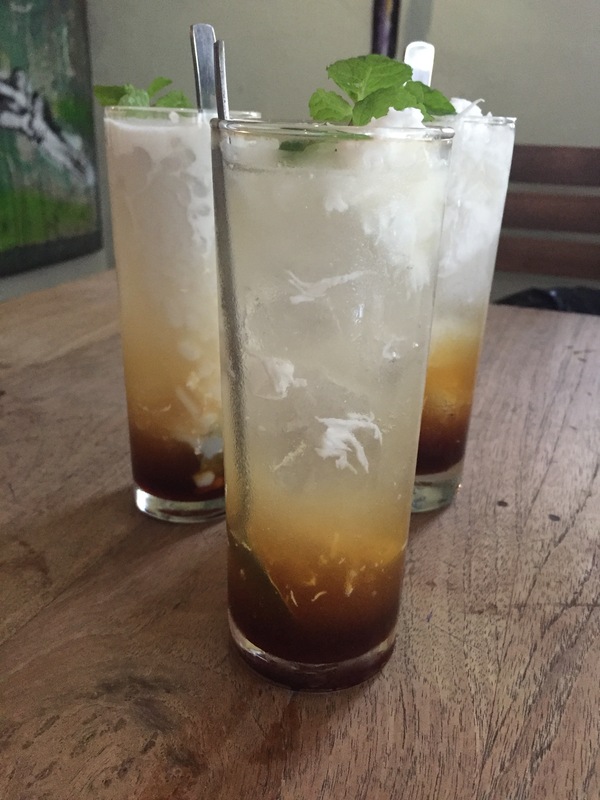 Via Via – A little café down the road from Mediterranea and Bu Ageng, and the fine purveyors of the delicious beverages pictured below. It has a great little shop next door and appears to organise interesting tours and excursions as well. We only stopped for a drink , but the menu looks promising and it’s on our list for a proper visit, next time. Address : Jalan Prawirotaman 30, Daerah Istimewa Yogyakarta. 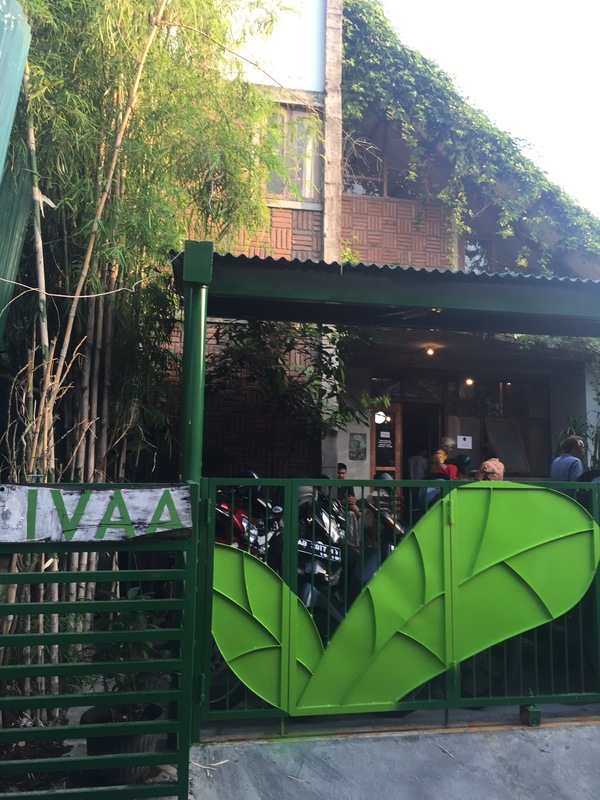 Coconut water, coconut meat and sweet, sweet gula melaka – the stuff dreams are made of, at Via Via. 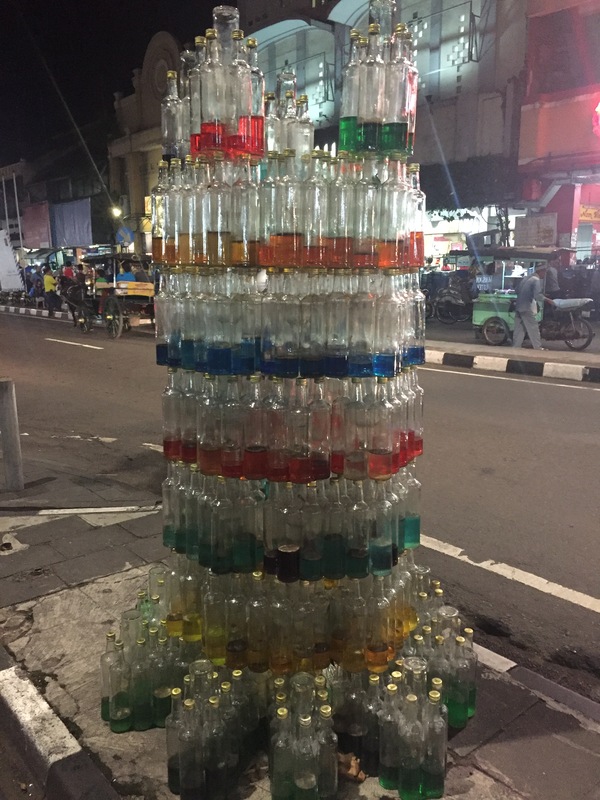 An artfully arranged tower of bottles, placed carefully on a road divider. About 50m away from this sculpture, we saw a couple of tramps going through the bins for bottles, probably to sell for a bit of cash. We didn’t quite know how to feel about that – on one level it was almost funny, one man’s meat is another man’s poison, and all that. But it does make you think about the art market, doesn’t it? 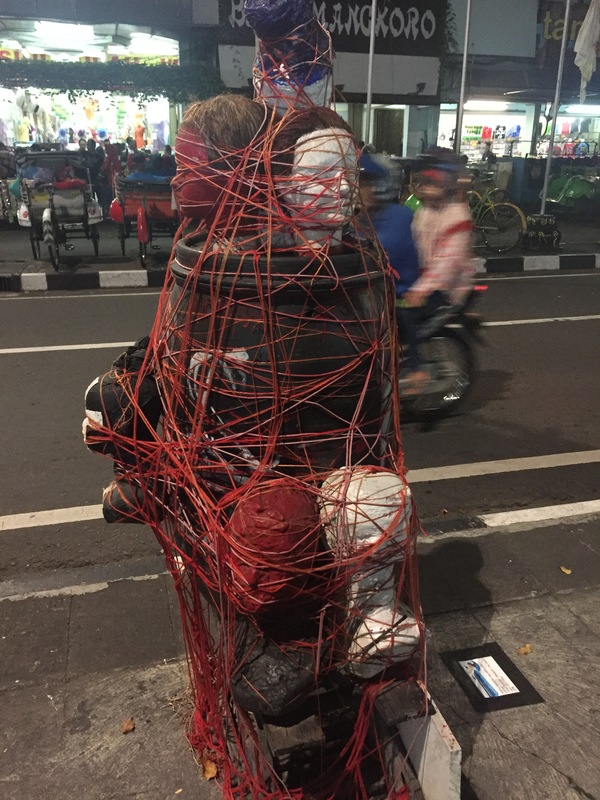 Tourists travel to Jogja for art, and so art is dished up on the touristy streets. And yet on the flip side of things, what value has art when bread and butter issues continue to trouble the local population? Maybe those bottles should just have been sold for recycling, and the money channelled directly back into the community? 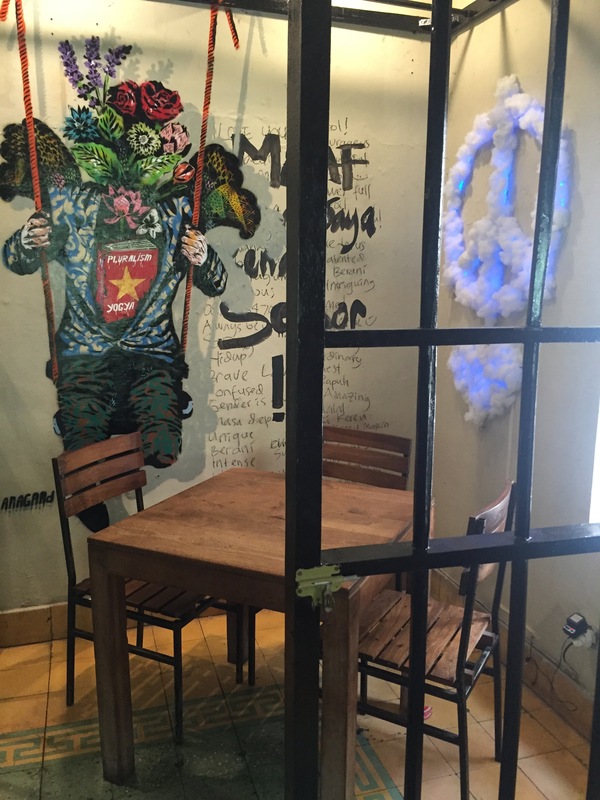 Touristy or not, there was lots of food for thought on Malioboro Street. And that brings us to the end of our guide – hope this helps you a little with your travel planning! We’d love to hear from you if you’ve found this useful, or if you have any suggestions to add. We would also like to give our friends Jimmy Ong and Amelia Abdullahsani a shout out for their excellent recommendations. Check out some of Jimmy’s fascinating work here .